Image caption Womad: Does the festival hold important lessons about the fluid dynamics of crowds? The World Music Festival, Womad, hosted a science pavilion this year. It's the latest attempt to reach non-scientific audiences by bridging the gap with the arts. But are such initiatives successful? "There is definitely a science to running an arts festival," according to the science presenter, comedian and self-described "geek songstress" Helen Arney. She's speaking backstage at the Physics Pavilion, the latest addition to Womad, the world music festival, in Charlton Park, Wiltshire, where artists such as funk singer George Clinton and sitar player Anoushka Shankar are appearing. "There is some really interesting physics going on here in the fluid dynamics of crowds. Making sure people can get from one stage to another in the minimum amount of time," she says. The pavilion's inauguration follows criticism by some, such as science writer Simon Singh, of the cost and effectiveness of some public science engagement. The fact that the crowd can flow freely is thanks in part to Womad's chief operating officer Mike Large, who, along with Prof Roger Jones, are the people behind the pavilion. They say they want it to bridge the gap between science and entertainment and reach out in a new way to a non-scientific audience. The weekend before Womad, the Bluedot festival debuted at Jodrell Bank and sold itself as a festival of music, science, arts, culture and space, but Jones and Large say the pavilion is the first time "real" science has been done at a music festival. "There are a lot of intellectually curious people here, probably not coming to learn about science, but it's a great way of talking to them," says Prof Jones. "Many of them are tax payers who fund what we do and it's important that they understand what their taxes are delivering." "What we do is help people bridge that gap themselves by stimulating them," says Mr Large. "The trick is communication. Music is about communicating emotion. Science is about discovering facts, but if you can't communicate them there is little point in discovering them." The two men came up with the idea for the pavilion when Mike Large, a physics graduate, was visiting the Large Hadron Collider (LHC) at Cern, where Prof Jones works on the Atlas experiment, as well as being head of physics at Lancaster University. One of the events over Womad's three days was a live video link to the Atlas control room near Geneva and the engaging American physicist Steve Goldfarb. As well as explaining that they are "trying to understand the basic building blocks of matter", he takes questions from the audience. Does he think the public understand what they do in Cern and why? "No, but we're working on it." Artist Gina Farncombe says afterwards: "I know nothing about physics and wouldn't have come to such a thing if it hadn't been at a festival." But she was disappointed by the video link. "Today wasn't so wonderful. I thought we'd get right inside the Large Hadron Collider, but Friday's solar storms session was awesome and made me understand the aurora borealis." Matthew Tosh brought smoke, flashes and bangs to the stage for the Physics of Fireworks session. Even his mention of the "C word" - chemistry - doesn't seem to put people off. Michelle Wooldridge, along with her five-year-old son Cassius, had travelled from Lewes in Sussex, where they have annual bonfire processions. "It's very interesting to find out how it's all put together," she says of what she's learnt about fireworks. "The gunpowder was my favourite," adds Cassius. Helen Arney sings, talks and jokes about science and uses a pun about Uranus, although she says she did not dumb down her performance for a Womad audience. "You don't need to know a tonne of science. I let the audience elevate themselves and learn and laugh," she says. But it is not just the professional comedians who can raise a laugh. When Jones takes his Atlas baseball cap off on stage he says: "We don't all look like Brian Cox, some of us do look like boring, middle aged, balding scientists." Perhaps the best attended event is the Q and A with Steven Moffat on the science and sc-fi of Doctor Who, with the audience overflowing onto the grass outside the pavilion. Despite this, Moffat, who is the BBC series' head writer and executive producer, says he knows nothing about science. "Putting science alongside music is the correct and proper way to apprehend science," he tells the BBC. "It's not a separate thing. They're not for different kinds of people. They're for exactly the same kind of people." At the Jamming with the Universe session two scientists from Anglia Ruskin University showed how they turn data from the LHC into music, and were accompanied by jazz pianist Al Blatter. Another non-scientific audience member Rachel Bennetts says: "Sometimes there's a feeling that science is a bit dry and separate from the rest of life. They're making it really accessible to us. It's interesting, understandable and quite beautiful." Simon Singh declined to comment on the Physics Pavilion, but Mr Large and Prof Jones say it cost less than £30,000, with the majority coming from Womad, and the rest from Lancaster University, Cern, the Institute of Physics and the Science and Technology Facilities Council (STFC). 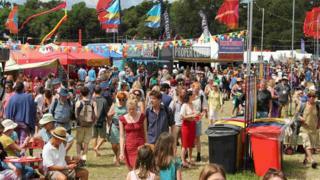 Up to 40,000 people attend Womad and Jones says: "This is a pretty efficient use of resources." He says most of those involved gave their time for free, many of the props will be reused and they hope to return in 2017. "I certainly hope this will be the future for outreach and science," he says.